Pine Tree Society began as Pine Tree Society for Crippled Children. In December of 1935, a group of 25, including doctors, officials associated with state government and other interested parties, met at the State House in Augusta. Their purpose was to form a Maine Society for crippled children. 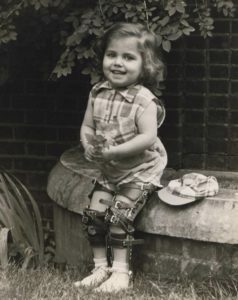 After the Social Securities Act was established, it seems like it was a national trend that each state would then establish their own organization for crippled children. 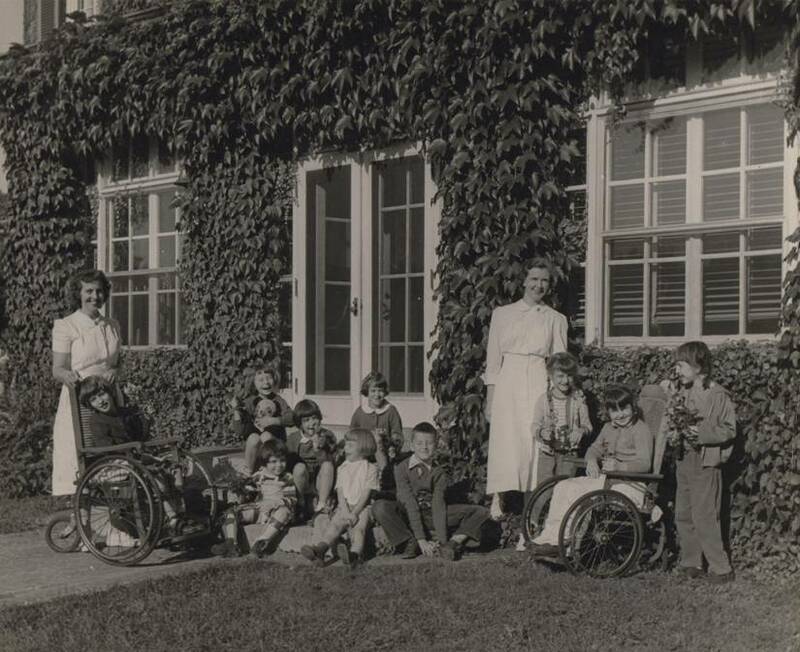 When it began, Pine Tree Society was tasked with helping children with disabilities live and play like “other children.” Some of its first services included providing teachers for children with disabilities who were unable to attend school; providing transportation to hospitals; and providing needed orthopedic equipment and devices. Pine Tree Society’s vision was to cooperate with all interested departments, organizations, institutions and individuals to that end that whatever “lacks and gaps” may now or subsequently exist in Maine’s programs for crippled children may be supplied and filled – but always in such a fashion that additional services will supplement and complement, rather than duplicate or displace, the aids that are already available to physically handicapped youngsters. In its first 10 years, the Society’s services expanded at such a rate that a $300,000 capital campaign was launched to construct a convalescent home to serve the 5,000 children with disabilities then living in Maine. In April 1947, the heirs of John Sedgwick Hyde, a Bath resident, donated the Hyde Estate to the Society to use as a rehabilitation and convalescent home. The Society’s Board of Directors accepted the generous offer and a 51-bed, inpatient home was established. The Hyde Home was initially funded through a $25,000 endowment created by Mr. & Mrs. Allen L. Goldfine of Winthrop, Maine. The 21-room mansion proved an ideal site to meet the children’s needs. Located on 23 acres of woods and fields, the facility included a greenhouse, an indoor swimming pool for hydrotherapy, classrooms, an elevator to accommodate wheelchairs, a converted ballroom for occupational therapy and a full medical staff. 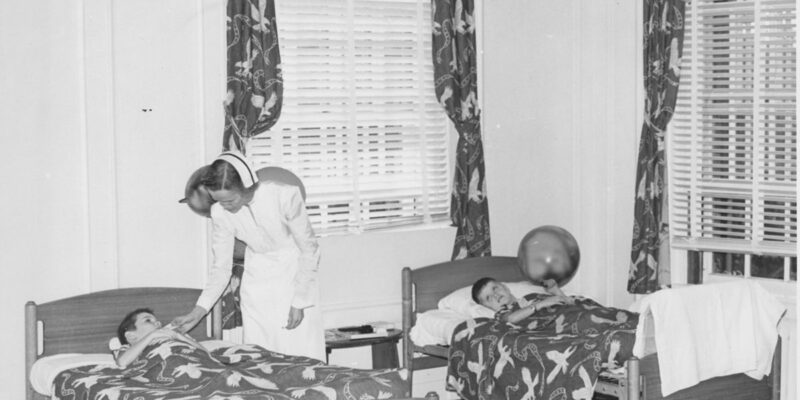 The facility’s flexibility proved essential during Maine’s poliomyelitis epidemic in 1949. During this period, the property’s name was changed to the Hyde Memorial Home and the inpatient capacity swelled to more than twice the planned caseload. In 1945, two years before acquiring the Hyde property, the Society rented a summer camp on North Pond in Maine’s Belgrade Lakes region. Society officials believed the property – consisting of 100 acres, a mile of frontage and 26 log cabins – would provide an excellent opportunity for children with disabilities to experience nature in a way previously unavailable to them. Known as Pine Tree Camp, the facility was rented for $600 and 75 children attended during that summer. The perfection of the Salk vaccine greatly reduced the incidence of polio and the Hyde Hospital’s caseload gradually declined. Adults were admitted in 1956 and the property’s name was changed to the Hyde Memorial Rehabilitation Hospital. A new addition to the facility, the Marie Preston Memorial Wing, was dedicated in 1960, honoring the Society’s second executive director who was instrumental in drafting and sponsoring a bill before the Maine Legislature that created the Division of Education of Physically Handicapped Children. In the mid-1960s, the Society faced the challenges of identifying those who could benefit from its programs and providing funding for expensive projects. Consequently, in 1965, the Hyde Memorial Rehabilitation Hospital program was relocated to Maine Medical Center in Portland. Society officials believed the proximity to complete medical care and a major population center would improve services available to Maine citizens. Maine Medical Center provided medical and administrative control while the Society provided funding to cover deficit spending. Funds raised through the sale of the Hyde property allowed the Society to expand the Pine Tree Camp facility and a major rebuilding effort was launched. 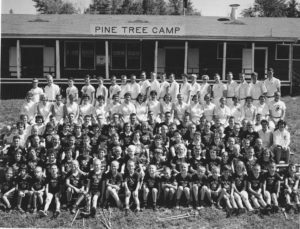 Today, Pine Tree Camp is perhaps the most visible of the Society’s programs. The funds also gave Pine Tree Society the ability to explore new opportunities. During that time programs like Audiology and Interpreting Services were established. 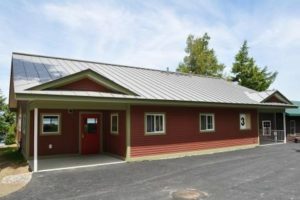 In 2010, Pine Tree Society undertook a major capital project designed to modernize Pine Tree Camp and address issues related to the care and comfort of campers. The projects also transformed Pine Tree Camp from a seasonal campus to a year-round facility dramatically increasing Pine Tree Camp’s capacity to offer programming and meet unmet needs. Pine Tree Camp’s Master Plan for Capital Improvement was budgeted at $6.6 million and addressed all aspects of the 285-acre campus. In 2015, Pine Tree Society met its fundraising goal, fully funding the construction projects. Completion of the Master Plan for Capital Improvement allowed the organization to shift resources to focus on overall expansion of impact to transform more lives, as outlined in the organization’s strategic plan. While Pine Tree Society serves the entire state of Maine, we have found that locations in Scarborough, Bath and Pine Tree Camp in Rome, limit our ability to effectively serve pockets of the state with documented high unmet needs. Lewiston/Auburn rose to the top as one of those areas. To that end, after careful research and analysis, on January 1, 2016, Pine Tree Society acquired Pathways, Inc., an organization based in Lewiston/Auburn allowing for the immediate expansion of impact into an under-served area.